Nikon is heating up market again since September 2010 with the release of it's latest DX format DSLR camera, Nikon D7000. Nikon’s D7000 features a 16.2 MP DX-format CMOS sensor, 6 fps continuous shooting and breathtaking Full 1080p HD movies with full time auto-focusing feature. In terms or video recording, Nikon D7000 has surpassed the power of Nikon's first video recording DSLR, Nikon D90. It comes with the full time autofocus shooting of HD quality video which D90 lacks. This is a great improvement for Nikon lovers who enjoy shooting HD quality video with their DSLR. According to the Nikon, Nikon D7000 falls between the Nikon D90 and Nikon D300s DSLR camera range. Here are some of the key features that D7000 carries. It has a High Resolution 16.2 MP DX-format CMOS sensor to give you large prints and tight cropping facility after the shooting. The D7000 inherits the same excellent three-inch, 921k-dot monitor as D90. It has a Dynamic ISO range from 100 to 6400 and expandable up to 25,600 (Hi2) which lets you shoot in near darkness and it’s Active D-Lighting feature helps you to restore the picture by enhancing the details in the shadows and the highlights. D7000 has a built-in speedlight flash that comes with an i-TTL and the Wireless Commander mode so that you can light up your subjects by controlling the wireless remote flash units. Built-in HDMI connection lets you connect your camera to the HDTV and playback with the remote controls. Optional MB-D11 multi-power pack further expands your shooting time while adding a vertical shutter-release and the control dials to the camera. The D7000 has a shutter speed range of 1/8000 to 30 seconds, with a top flash synchronization speed of 1/250 second. And just like with professional models, the shutter unit is tested for 150,000 cycles in severe conditions, proving precision and durability. Nikon has made D7000 with a ground-breaking 2,016-pixel RGB (3D Color Matrix) sensor which delivers more accurate control of light metering and optimizes the Scene Recognition System for the exposure, white balance, focus tracking and i-TTL flash control. D7000 shoots with the High Speed 6 frames per second continuous shooting up to 100 shots and helps to capture the most fleeting action. It has a highly customizable 39 point AF System which includes nine center cross-type sensors that operate with every AF NIKKOR lens so that you can focus on making great images. The D7000 offers smooth switching from the regular shooting to the Live View shooting with the dedicated Live View switch. Large, easy-to-view 7.5 cm (3-in.) VGA wide-viewing-angle (170°), approximately 921k-dot TFT LCD monitor with the reinforced glass realizes comfortable Live View shooting. The D7000 also allows contrast-detect AF. By selecting AF-F (full-time-servo AF), the camera automatically tracks the subject continuously even if it moves during the Live View shooting. There are selectable AF-area modes according to the subject; face-priority AF, wide-area AF, normal-area AF and subject-tracking AF. This is completely new feature to any of the DX format Nikon DSLR camera. U1 and U2 mode allow you to save your camera settings into the memory. These are two user definable settings right on the Mode Selector Dial which let you store most camera settings so that you can go back to them at anytime without the need for further adjustments on the menu settings. The U1 and U2 modes are easy to set. You just have to navigate through MENU >> SETUP >> Save user settings where you have to select U1 or U2 and then Save settings. Any changes you made in this mode can be permanently set by repeating the action above. In addition, it comes with nineteen other options of scene modes, such as Silhouette, High key and Low key, Portrait, Landscape, Child, Sports, Close-up or Night Portrait that are selectable by setting the mode dial to the SCENE mode. You can reduce the sound of mirror-up and mirror-down during the shooting by selecting the "Q" on the release mode dial. This improved quiet shutter-release mode is a convenient function for scenes such as a school play or when shooting wildlife, special events which are sensitive to noise. D7000 is equipped to capture Full 1080p HD Movies with the Full Time Autofocus and an external stereo microphone jack to record the cinematic-quality movies up to 20 minutes all enhanced by the Nikkor interchangeable lens quality and the versatility. 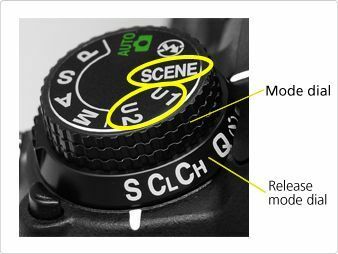 You can set both the aperture and the shutter speed from the camera in movie mode, although the slowest shutter speed is limited to 1/30th second, plus exposure compensation and AE-Lock can also be set. Out of the box, the D7000 can only record mono sound via its built-in microphone with three different levels of sensitivity on offer, but stereo recording can be recorded using an optional external microphone. This feature is especially useful for landscape shooting, the virtual horizon indicated in the LCD lets you know when the camera is in level. The virtual horizon can also be displayed during the Live View shooting. This feature was available only on pro cameras like d300, D300s or D700 before D7000 was introduced. Twin SD Card Slots with SD, SDHC, SDXC memory card compatibility gives you options to keep on shooting and not to worry about memory being full or separate your NEF (RAW), JPEG and movie files. Or if you want, you can also program the camera to store images in the first memory slot and store a backup copy of those images in the second memory slot which gives you peace of mind while shooting important events, wedding for example. You can do that by navigating through the Shooting option in the MENU where you can define what you want to do with the card in each slot. Many reviewers already started claiming that the Nikon D7000 is a top line DX format camera Nikon has ever built. No wonder it's already sold out in many camera stores. As of writing this post, Nikon has tagged it's price for $1,199.95 (Body only).